"Value" President Lee You-Sun poses in front of her shop. "Surprisingly lower prices and various types of suits and other clothes are attracting foreigners in the shopping district of Seoul's Itaewon, South Korea's most well-known expatriates' center for eateries, bars, and shopping," said a merchant in a recent interview. Located on the fourth floor of Itaewon's largest shopping center "the Hamilton Shopping Center" Lee You-Sun has been managing her suit company "Value" for over two decades now. "I started 23 years ago with just one side of this store," Lee said "And nine years ago I decided to broaden the company with another store here in the Hamilton Shopping Center"
With four full-time employees and several of part-timers Lee has been meeting the demand of her foreign customers as well as Korean nationals. She said that foreigners visit her store due to the low prices and the quick process of custom-made suits and shirts. "Unlike other countries a suit ordered here can be ready within 24 hours," Lee said. "Some countries like Europe it takes even a month"
So, the unusually short process at her shop is very convenient for the busy travellers when they come over just for a couple of days to do business. Lee said that her suits can be 10 times cheaper than some foreign countries, particularly for those customers from Europe or North America. "A custom-made suit here still is five times cheaper than in Japan," she emphasized. Some 80 percent of her clients are foreigners and over 60 percent of her foreign customers are Japanese. As for Lee foreigners are easier to deal with. "Foreign customers are kinder than domestic Koreans," Lee explained. "Also we try to be nicer to them because of language barriers"
"Actually, we try to help the foreigners more because they do not know things around here in Korea," Lee added. "Value" President Lee You-Sun (right) interviewed by Ms. Joline van Gelder, Dutch correspondent of The Seoul Times. "Korean shoppers already know the prices so they don’t bargain a lot," she said. She said that shoppers from Japan and Europe think that prices here are very cheap whereas those from India and Southeast Asian countries say that prices are very steep. One time an African man came to the store. He was wearing very shabby clothes and she thought that he was not even able to afford a suit. Soon after a group of bodyguards showed up to protect the man. “I was honored that he came to our shop to buy a suit,” Lee added. This is what Lee finds nice about her job. Lee said that she likes a variety of people visiting her shop. “I like working with all kinds of people from very important people to average travelers,” she said. "I like to build a good relationship with my customers"
She parcels out some presents to her customers from time to time. The customer sent me a thank-you card and New Year’s card as well. 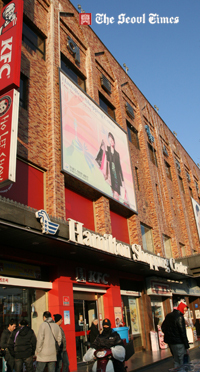 Lee’s shop is one of the 151 shops housed in the Hamilton Shopping Center, the biggest shopping center in Itaewon. Here you can find everything; scarfs, suits, bags, shoes, jewelry, and a lot more. The whole Itaewon area is a good place to meet people, to shop, and to go out for a good meal. It is well known for its good stores, nice bars, and a lot of foreigners. Itaewon was designated by the South Korean government as "Special Tourism District," a must-see place for the foreign travellers and tourists. Visitors can sample a variety of delicacies of each nation. Authentic restaurants of such countries as Thai, Mexican, French, Italian, Indian, Pakistani, and Belgian are lined on the Itaewon streets. Traditional Korean restaurants boast of superb tasts at reasonable prices. Bars and clubs add extra flavor to the tastes of both foreigners and Koreans alike. “I still love what I do every day,” Lee added. Lee is definitely one of the strong attractions for foreigners to visit Itaewon. Ms. Lee You-Sun can be contacted at 792-6970 or her mobile is 010-6239-1718.